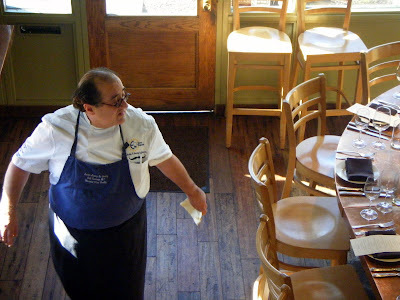 Internationally renown chef Joseba Jimenez de Jimenez, wearing his heart on his sleeve. Perhaps you’ve heard the gossip surrounding the splitting of their sheets? If so, you’re not alone. If they weren’t so sick of hearing it themselves, insists Carolin, the gossip-mongering would be funny. “I’m buying Joseph out,” says Carolin, who calls her husband by his Anglicized name and is now going by her maiden name, Messier. Which, pronounced the way it’s spelled, defines the opposite of the way they hope the denouement of their divorce will go. Carolin Messier — hold the Jimenez — at Harvest Vine. “I feel very sad about leaving the business,” admits Joseba, but it’s a good change.” One that’s allowing him to pursue a new international venture — offering gastronomic and enological tours, consulting with restaurateurs, developing recipes and training other chefs here in Seattle and farther afield. During the next year or so, we’ll find him hosting the occasional “Guest Chef” dinner at Harvest Vine (and elsewhere, including this upcoming gig at Olivar), teaching a class or two and consulting with his friend and successor, Joey Serquinia — now overseeing the restaurant kitchens at Harvest Vine and Txori as corporate executive chef. It should be business as usual at the two restaurants, the couple insists. 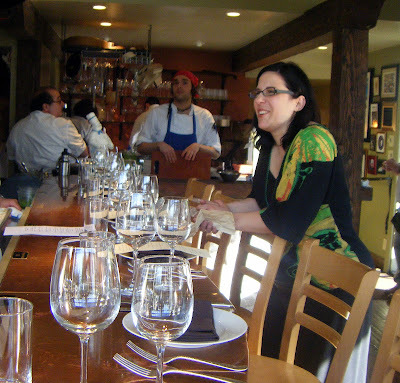 And as anyone who spends much time at Harvest Vine will tell you, it’s not unusual to find someone other than the bodacious Basque at the stove. Rest assured, says Joseba, you’ll still find their warm and wonderful Argentinean waiter Juan Carlos tending tables — as he has for years. That’s Kylen McCarthy, dishing up “family dinner” to Juan Carlos after a busy shift. He’s been promoted to No. 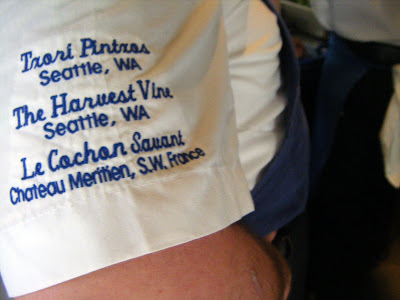 1 chef at Harvest Vine, where he’ll be overseen by Joey Serquinia. Joseba feels confident their management team can continue to run the business the couple nurtured together. Whatever may have happened in their personal life, he says, “business is business.” Sad though he may be to relinquish the reins of Harvest Vine, “I hope the people of Seattle — and the United States, because we have people come here from all over — can give it a chance without me,” he says. 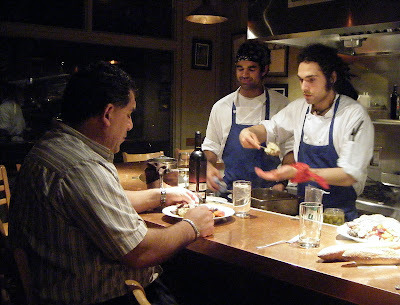 Yes, he’ll miss playing the role of the patron, though he’s already hatching plans to one day open another Seattle restaurant, so stay tuned for that. 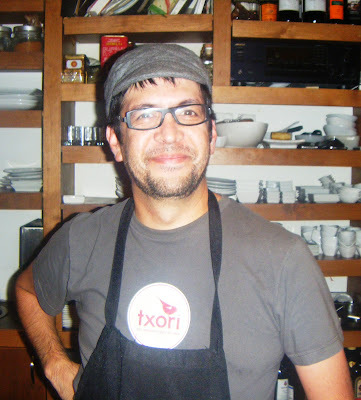 Joseba will be missed at Harvest Vine as well, says his wife, who still recalls the early years when, to the delight and amazement of their customers, he once came dancing out of the prep-room in their tiny tapas bar with a six-foot octopus draped around his neck. She won’t forget how “he’d flirt with a little kid behind the bar, bring him back and teach him how to fry an egg,” and she’ll always remember him for his generosity. A few years after they opened Harvest Vine, a regular customer came in to tell them she was moving to San Francisco and would dearly miss the place. “He took off his expensive Brigard embroidered jacket,” recalls Carolin (noting they were absolutely broke at that time) and gave it to her. “He said, `Take this, so you’ll remember us while you’re cooking in San Francisco. '” Another couple came in weekly and ordered a $75 bottle of rioja. When the dot.com industry crashed, the guy’s job crashed with it. “They came in and said, `This is the last time you’re going to see us for a while,'” remembers Carolin, and instead of their usual bottle of Marques de Riscal Baron de Chirel, they ordered the winery’s $30 label. Joseba brought out the $75 wine and uncorked it — on the house.